Just outside a tiny town called High View, West Virginia, lies a “forest tradition” monastery, the Bhavana Society, founded by Bhante Henepola Gunaratana, who goes by “Bhante G.” Born in rural Sri Lanka in 1927, he became a monk at age 12 and has lived in the United States since 1968. My home is only 50 miles from the Bhavana Society, and for awhile I went there often, once for a four-day Thanksgiving Weekend retreat. In Bhante G’s first dharma talk during that retreat, he began by finding it interesting that every years Americans show their gratitude by killing 50 million turkeys. 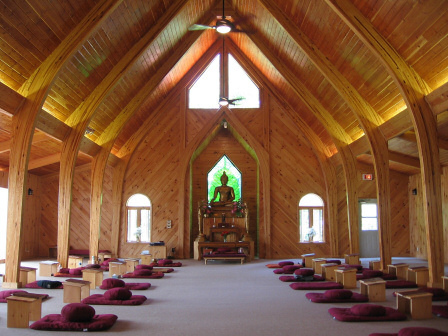 But I bring up the Bhavana Society today because of its meditation Hall, shown in the photo. Just being in that hall conveys a sense of peace and calm. Every floorboard in the hall was set in place by one of the monks and affixed so that it would never squeak. Then the floor was covered in carpeting. During meditation, one can stand up, walk out, and return without making a sound or being noticed. With all due respect for the wisdom of the monastics, I wonder why they seek such total silence for meditation. After all, the Buddha (or God, or the Inner Light, or whatever you consider holy) is in everything. We meditate in part to experience the present moment as it is, and to accept it as it is. We also meditate so that we can carry our accepting and peaceful calm out into the world. Why not practice by letting the world in? That barking dog, the crying baby — beautiful. Even the hunter’s gunshot is a manifestation of our sacred interdependent world. What’s noise to one ear is music to another. May it all be music for you. I usually end my posts with a short related piece of music. This one is longer. When you can spare 20 minutes, try meditating with it as the background. Lose yourself in it. Or maybe I should say find yourself in it.